From a report to the City of Benicia Department of Public Works & Community Planning. WORLD WAR II AND ITS AFTERMATH (1940 TO 1964). At the close of the 1930s, Benicia seemed a small town, quite isolated from the troubling events taking place in Europe and elsewhere across the globe. But with Hitler’s invasion of Poland in 1939, and Great Britain’s subsequent declaration of war, the United States rapidly began to put itself on a military footing. The San Francisco Bay Area was a major center of the push for military production, as it featured a near ideal combination of railroads, factories, oil refineries and deepwater access. Unemployed civilians from across the country poured into the area, eager to find work at places such as the Kaiser Shipyards in Richmond or the Navy Yards at Mare Island. The Benicia Arsenal also sprang into action, and in short order the city embarked on one of the most dramatic periods of growth in its history. 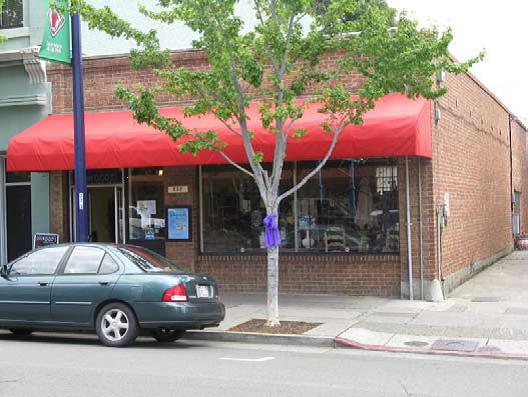 The boom years of the war witnessed tremendous employment growth in Benicia, and must have come as a great relief following the industrial decline of the previous decades. But this growth also came at a cost in terms of housing shortages, overtaxed infrastructure, and of course the loss of some of its citizens on foreign battlefields. Likewise, when the war ended, so did the flush times, and Benicia’s economy slowed dramatically. It was revived for a time by the Korean War, which saw employment at the Benicia Arsenal reach its all-time peak. But again the city struggled with the peace. For good or for ill, the city’s fortunes rested almost entirely with the Arsenal—a fact made all the more painful by its closure in the early 1960s. Nevertheless, that same event also provided the opportunity for the city to purchase the Arsenal, and its subsequent redevelopment as an industrial park again put the facility at the forefront of Benicia’s economy. While the United States would not enter World War II until 1941, the turbulent events taking place in Europe and Asia convinced government officials to embark on a massive program of preparedness. Military facilities across the country sprang into action, and the Benicia Arsenal—as the West Coast’s primary ordnance facility—was a hub of activity. By October 1941, work had begun on a new 500-foot-long deepwater wharf capable of docking four Liberty Ship transports simultaneously. That same year, work began on a new ordnance machine shop (Building 91), two new storehouses (Buildings 89 and 99) and six Public Quarters buildings (no longer extant). The Arsenal also began to produce ammunition in enormous quantities, resulting in an acute need for safe storage. Ammunition bunkers consisting of 109 reinforced-concrete structures called “igloos” were sunk into the Arsenal grounds at various locations. After the bombing of Pearl Harbor, the Arsenal was designated as the exclusive depot for combat operations via the Ports of Embarkation in San Francisco, Los Angeles and Seattle. The work was immense. Over a period of just eight months in 1942, the Arsenal churned out more than 42 billion rounds of ammunition. It provided the Army with munitions, cannons, tanks, scout cars, and halftrack vehicles. It also produced binoculars, watches, clocks, and chronometers. Salvage was another important aspect of the work. Early in the war the arsenal handled 850 tons of obsolete arms. More buildings were needed, as well as space. Early in the war the military purchased over 1,800 acres to the north of the reservation, expanding the Arsenal’s acreage from 345 to 2,192 acres. An additional 572 acres were leased. In April 1942 construction began on a cantonment barracks for over 1,000 officers and men from the 501st Anti Aircraft Artillery Battalion, which was designed to protect the facility from air raids. Given the frantic pace of construction, most of the larger buildings constructed during World War II were constructed using reinforced concrete and were purely functional in design. Most were also concentrated close to the waterfront to take advantage of rail and ship connections. The year 1942 also heralded the construction of a new Main Headquarters (Building 92), which was, and is, unlike any other at the Arsenal. Completed in the Spanish Colonial Revival style, this outstanding building features Churrigueresque ornamentation at its entry, which had first gained popularity in the United States following its use at the 1915 Panama-California Exposition held at Balboa Park in San Diego. Such embellishment likely reflected the prominence of this building as Arsenal headquarters, while its overall stylistic impulse reflected larger trends in California. 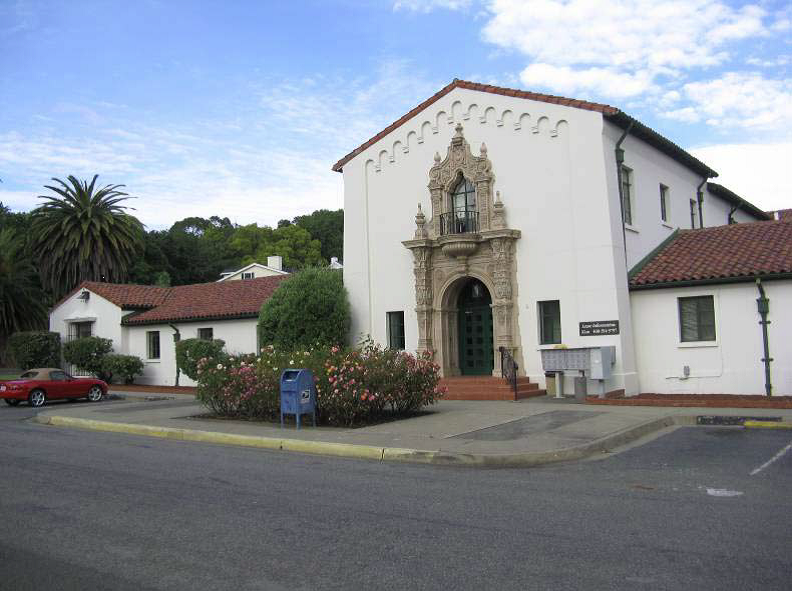 Indeed, the Benicia Grammar School, also completed in the Spanish Colonial Revival four years earlier, features very similar massing. Main Headquarters (Building 92), 1942. This ornate building stands in stark contrast to the more utilitarian structures built during World War II. More Arsenal facilities followed. These included a new carpenter shop in 1942 (Building 98), and then another the following year (Building 116). A new fire station was constructed in 1943 (Building 105); a Time Clock Building in 1944 (Building 184); and two new warehouses (Buildings 159 and 163), built in 1944 and 1945 respectively. In total, at least fifteen buildings constructed between 1940 and 1945 still survive. The demands of wartime production saw employment at the Arsenal grow exponentially, from just 85 workers in 1939, to over 4,500 by October of 1942. Fully half the employees were women, performing duties that ranged from repairing field glasses, to operating cranes, to repairing carburetors. The payroll also expanded dramatically, rising from $1.8 million in 1941 to nearly $18 million by the end of the war. The Yuba Manufacturing Company was also caught up in the war effort, primarily building 155mm howitzers. The demand for workers was so great that Benicia high school students spent their summers working at the Arsenal, and even Italian and German prisoners of War were used for labor. The influx of workers pouring into Benicia put an enormous strain on Benicia’s limited supply of housing. According to Benicia Resident, Dale Killan, who worked at Yuba Manufacturing Company: The Benicia Arsenal was hiring everybody who could stand up. The war had started, and people were coming into Benicia from all over the U.S. There was no place to live—there were not even any rooms. We finally got a government trailer, but we had friends living down on the bay in tents because they couldn’t find anyplace to live. To meet the immense need for housing, Benicia residents initially housed newcomers in rented rooms, garages and even barns. But clearly more help was needed. In 1940, the federal government’s Lanham Act provided approximately $150 million to the Federal Works Administration, allowing it to build over 600,000 housing units in partnership with local authorities across the nation. Ultimately, organizations such as the Benicia Housing Authority received housing funds from a variety of government sources, including the Farm Security Administration, the Federal Public Housing Administration and the United States Maritime Commission. In most cases, the buildings constructed were designed to be “temporary,” although they persisted in many communities long after the end of the war. In 1940, a 50-home government housing project was begun for civilian employees of the Benicia Arsenal. The first units completed were several duplexes adjoining the Arsenal gate, several of which survive today on Buchanan Street. Another 38 units were built between East Third, East Fourth, East M and East O streets, developed by Fred Early, Jr. of San Francisco. The Farm Security Administration hired noted San Francisco developer, Oliver M, Rousseau, who constructed three dormitories for Arsenal employees on land leased from Lawrence King in Benicia. A government trailer camp with 50 trailers was established, as was a trailer camp on the north side of East H Street, east of Fitzgerald Field. Other public housing projects included Dalton Manor and Grant Circle, as well as a large complex at Francesca Terrace, part of which was later developed into Francesca Terrace Park. Research has not revealed the exact number of public housing units constructed in Benicia during World War II, but a report describing the city’s resources in 1947 stated that there were “724 housing units of public housing operating under the local housing authority.” Presumably, the buildings were similar in size and configuration to other public housing units then being built throughout the Bay Area in locations such as Oakland and Richmond. Typically these were simple rectangular frame buildings, one or two stories in height, and often arranged in duplex or triplex configurations. An aerial photo accompanying the 1947 report appears to show the duplex units constructed near the Benicia Arsenal gate. Though the photo is indistinct, the basic configuration is quite similar to other public housing projects in the Bay Area. Similarly, there exist in Benicia at least eight duplex buildings that appear to conform to the basic public housing typology. Four are located at 140 – 170 West I Street; two are located at 150 and 160 West J Street (The Palms apartments); and two others are located at 160 and 170 East K Street. Although they have all been altered to varying degrees, their basic design is identical, and nearly all were in place by the time the 1942 Sanborn Fire Insurance Company maps were completed. 170 West K Street. This design is very typical of public housing constructed during World War II. It has been reclad with asbestos shingles, but the windows appear to be original. Other areas in Benicia suspected of having World War II-era public housing include a cluster of duplexes on the northwest corner of Military East and East Seventh Street. Across the street is a trailer park, which may also be the site of the World War II trailer camp mentioned previously. More permanent housing was also constructed. The Federal Housing Administration’s earliest efforts to relieve wartime housing shortages were through partnerships with local housing developers. Although the War Production Board Limitation Order of April 1942 put a halt to all private construction not essential to war needs, defense housing was exempted. The FHA’s Title 6 program provided federal guarantees for loans to private developers. In 1941, 110 homes for Benicia Arsenal workers was completed by the Herbert Mayson Co. of Los Angeles as the Linda Vista subdivision, located between East Second and East Third Streets. The following year, the Schultz Construction Company completed work on a 290-home subdivision known as “The Highlands.” Located on 60 acres in the northern portion of Benicia. The Highlands offered modest single-family homes with prices ranging from $4,175 to $4,750. Owing to the hilly topography in this area, the streets did not conform to a typical grid, but rather curved along grades, and were sometimes laid out in a circle or as a cul-de-sac. Likewise, in a departure from Benicia’s previous pattern of numbered and lettered streets, these streets were given Spanish names, such as La Cruz, Corte Dorado, and Linda Vista. 4 La Cruz Street, 1943. This Highlands subdivision house is typical of the modest single-family residences constructed during the war years. In addition to The Highlands, another 123 similarly-priced homes went up in the “West Manor” subdivision in 1943. Located at what was then the northwestern edge of the city, West Manor’s streets also departed from the original street grid, with the primary street, Buena Vista, laid out in a long circle. The entrance to the subdivision on Alta Loma Street was enhanced by the construction of decorative pylons bearing the subdivision’s name. Another development, called the “Wainwright Tract,” was completed by the builder William Newsom and centered along Wainwright Street. 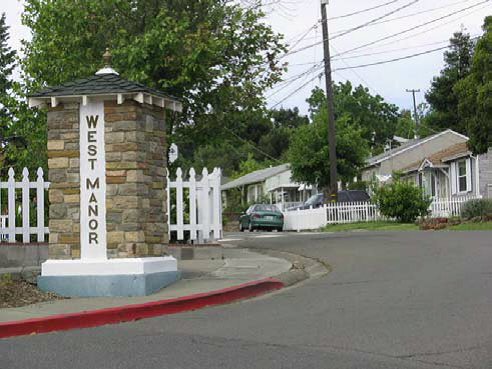 The entrance to the West Manor subdivision at Alta Loma near West Seventh Street. 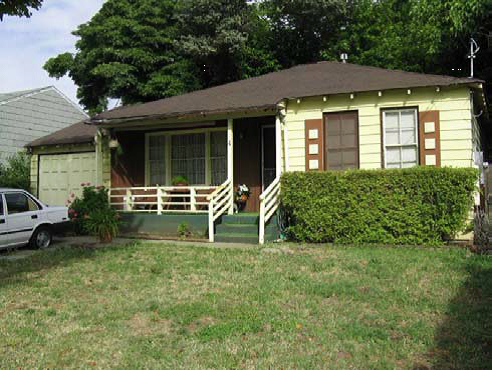 Single-family homes were also constructed individually and in clusters during World War II, usually appearing as infill in existing neighborhoods. An example includes a row of homes on the west side of East Third Street between East J and East K streets. As they had during previous eras, Benicia’s boarding houses frequently provided rooms for newcomers, while also continuing to operate as bordellos. Business was booming. With the influx of military personnel and war workers, Benicia’s brothels, which numbered almost fifteen at this time, were operating around the clock. It is estimated that the brothels—including the Alamo Rooms, Union Hotel and Washington Hotel—brought in nearly $7 million dollars annually during World War II, making it the city’s second largest industry after war production at the Arsenal. The national campaign for “total mobilization” enlisted home front Americans to aid the war effort, and residents of Benicia joined in eagerly. Although items such as gasoline, meat, tires and many other items were rationed, residents planted victory gardens, took up metal scrap collections, and initiated war bond drives and other programs in support of the troops. The American Women’s Voluntary Services organization set up centers to care for “eight hour orphans” of working mothers. Dances were held at the B.D.E.S. hall to provide entertainment. With their close proximity to the Arsenal, the citizens were also asked to adopt security measures. People put up blackout curtains on their windows, and volunteers of the Ground Observer Corps manned air raid stations to look out for enemy airplanes. All small watercraft also had to be beached for the duration of the war. Transportation infrastructure was also stretched to the limit, as many workers arrived in Benicia via the Martinez – Benicia Ferry, which was running three boats, the City of Seattle, Issaquah, and the Charles Van Damme. Many Benicia residents also commuted to work at Mare Island via buses or car pools, as gasoline rationing severely limited private automobile usage. Over the course of the war, the population grew from around 2,500 in 1940, to over 8,300 by 1944. To meet the increased demand for deliveries, the U.S. Postal Service constructed a new post office at 632 First Street, which opened on January 15, 1942. In 1944, another satellite postal station was also opened at Dalton Manor, which operated until 1954, presumably when the units were demolished. 632 First Street, constructed as a U.S. Post Office in 1942. The war also brought social changes that left their imprint on city government. In 1940, the city established its first commission form of government and—perhaps emblematic of the growing female workforce—elected its first female politician, Elizabeth McKay, as City Treasurer. The following year Anna Pine was elected as City Clerk, serving in that position until 1968. On the night of July 17, 1944 Benicia experienced one of its most terrifying moments of the war when it was rocked by an enormous explosion across the Carquinez Strait at Port Chicago. There, two Navy freighters loaded with explosives accidentally detonated and killed 388 people. The blast was so large that many Benicia residents thought they had been bombed. The blast broke nearly every window on First Street, caused $150,000 in damage to the Benicia Arsenal, and $27,500 in damage at the federal housing units.150 During the last year of the war employment at the Arsenal reached its peak, with 3,636 civilian employees and 1,500 Army personnel. At the time, it was receiving, storing or shipping 3,000 freight carloads of small arms, artillery and ammunition each month. Yuba Manufacturing’s record was equally impressive; it had turned out some 7,000 howitzers, which totaled 70 percent of those used during the war. Then came the dropping of the atomic bomb, followed by the surrender of Japan. The war was over, and Benicia’s wartime boom years came crashing to a halt. Soon after the close of hostilities, the Army undertook dramatic cutbacks at the Arsenal, and by 1947 the number of employees had fallen to under 2,500. Nevertheless, many of the new residents chose to stay after the war, and the city’s population declined only by around ten percent. At this time, the Arsenal’s primary duty was destroying tons of unused ammunition, while also processing enormous quantities of equipment for scrap or salvage. As late as 1950 there were over 146,000 tons of supplies stacked out in the open for lack of warehouse space. In the midst of this slowdown, the city looked for outside investment. In 1947 a report was prepared to convince the Army to construct a general distribution depot in Benicia. While the effort failed, the report provided an excellent accounting of the town in the years immediately following the war. Among other items, it stated that Benicia was home to 1,351 private housing units, of which 40 were vacant. There were also 724 public housing units, of which 50 were vacant. Vacant lots numbering 400 were available in improved subdivisions, while approximately 1,900 acres of undeveloped land was available at Southampton Bay, valued at $10 to $30 acre. The largest industrial employer was the Arsenal, with the only other remaining industrial facilities counted as Yuba Manufacturing, which was manufacturing gold dredges and road equipment, as well as Benicia Products Company, the American Sardine Company, Golden State Fisheries, and Benicia Food Products. The city counted 74 retail stores and 34 service establishments. In terms of public facilities, the report lists three grammar schools, a kindergarten and a high school. The police department counted about two dozen employees operating out of the old Benicia firehouse adjacent to the Capitol on First Street. For its part, the fire department was headquartered in a new firehouse built in 1946 at 900 East Second Street within a recently-created city park reclaimed from a marshy area. The decision to build a modern firehouse may have been due in part to two fires the previous year which destroyed the Solano Hotel and the Benicia Tannery, respectively. Vallejo Times Herald Editor Wyman Riley reported in his October, 1962 Sunday Notebook column that “there was probably no community in the United States so affected by troops stationed within its city.” He was referring to the deployment of the 211th to the city of Vallejo during World War II. The famed 211th Coast Artillery Anti-Aircraft Regiment better known as ‘The Boys from Boston’, arrived into the city of Vallejo a few days after the 1941 attack on Pearl Harbor. Its job: to protect Mare Island Naval Shipyard and the city of Vallejo from any further Japanese attacks. They set up their anti-aircraft cannons on every hill, and 50 caliber machine guns on city rooftops, and then waited for what fortunately never came. “The Boys From Boston,” by author Gary Cullen is a compilation of stories that tell of that time, when 1800 soldiers came to the Vallejo community and how they were welcomed with open arms at the onset of the war. Bringing their good looks, Army green uniforms, east coast charm and Bostonian accents, they captured the hearts of the local citizens. The Boys would eventually return to Vallejo to marry, to raise families, and to start new civilian careers. The author, a native Vallejoan, and son of one of those “Boys” hopes to share their story in his new book citing testimony from many Vallejoans who witnessed first hand the life in Vallejo during that time. An exhibit of 211th artifacts is currently on display at the Vallejo Naval Historical Museum. The exhibit highlights the 211th’s role in Vallejo during WWII, along with the lives of many of the veterans who eventually returned to Vallejo after the war ended.